The vehicle used for drawing up these application docs was a USDM 1997 Mazda Miata 1.8L with a manual transmission. All factory electronics/ignition system components are in place and the factory wiring harness is in satisfactory condition. * European �96-�97 models with immobilizer use 1V for the fuel pump output. In the Jumper Notes above we’ve included a pair of jumpers for radiator fan activation using the ‘Relay 1’ circuit. You’ll notice we suggested using PA0 on the mainboard to drive the fan, and run the output from ‘Relay 1’ over to 1A on the ConnectorBoard to drive the fan relay. You can configure the fan activation in TunerStudio from the ‘Extended > Output Ports Settings’ Menu. More information on configuration can be found in the MS2/Extra Documentation here. In the Jumper Notes above we’ve included jumpers for A/C clutch and fan activation using the ‘Input 1’ circuit. 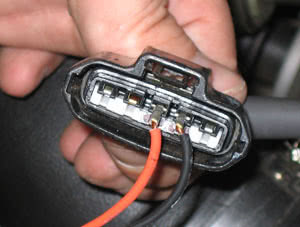 The Input for the AC system comes in from the A/C switch on ConnectorBoard pin 1K. The output of the “Input 1” circuit gets jumpered to both 1B and 1G on the ConnectorBoard. These two pins will activate the A/C compressor clutch relay and the A/C condensor fan relay. You will need to leave R14 out of this circuit or cut out R14 if you installed it. 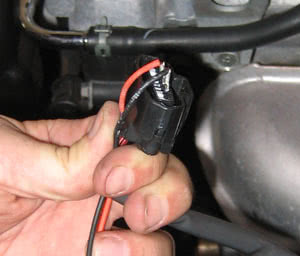 If you have swapped in a VVT motor from a ’01-’05 Miata and wire the sensors directly to the DIYPNP, sharing them with the VVTuner (instead of using pass through mode), connect the R3 resistor in the 5 volt position instead of the 12 volt. Using the 12 volt may cause sync problems. The DIYPNP allows you to disconnect the Mass Air Flow meter. When you remove the MAF, you will need to install a GM style intake air temperature sensor in your intake. This sensor connects to the third and forth pins on the IAT connector, as shown in the photos below. IAT sensors have no polarity, so it does not matter which wire you connect to which pin.